Once again the Court backlog makes the front page. Kim Bolan was reporting on how the shortage of sheriffs for court was resulting in many cases getting adjourned. 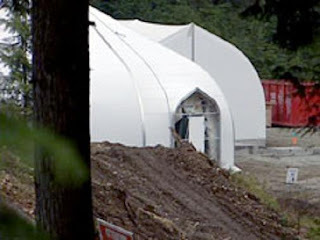 At the same time we also read about how the prisons in BC are over crowed to the absurd extreme where Gordo the Glutton was building prison tents in BC. I kid you not. All this was happening before Harper's disproportionate crime bill that will now send that fragile system into absolute chaos. Realistically someone who committed murder won't have their case dropped as that would hopefully be somewhat of a priority. Yet the other prioritization has already gone astray. According to government figures provided to The Province, as of Sept. 3, there had been 73 judicial stays of proceedings for adult criminal and youth cases in B.C. Provincial Court so far this year. In 2010, there were 58 judicial stays for the entire year. The Vancouver Province listed a few of the many cases that were dropped because of delays resulting from shortages. Some of the cases weren't significant yet others were. In 2009, Jason James Horner and Robert Luigi Polani had their cocaine conspiracy charges stayed when a judge found their three-year-old case had taken too long to get to trial. A Crown appeal of the rulings by B.C. Supreme Court Justice Peter Leask was heard last November and a decision is still awaited. Peter Leask hearing another cocaine case. God help us. In May 2010, Provincial Court Judge Ronald Webb, in staying a charge of possession of cocaine for the purpose of trafficking against Darren Bryan Williams of Cranbrook, said trial dates were hopelessly overbooked. So right now we are already seeing over crowed prisons and case back logs where important charges like trafficking cocaine are being dropped. Knowing this, Harper then goes to the opposite extreme, leaving hard drugs aside, sets out on his own Don Quixote crusade against those evil pot growers by imposing mandatory minimum sentences of two years for growing pot. No wonder Mr. Harper hasn't increased mandatory minimums for crack. He must be smoking it himself. Unlike the bleeding hearts, I most certainly don't have a problem with mandatory minimum sentences. For murder or trafficking cocaine. Not for smoking or growing pot. Especially when the courts have directed the government to fix the current problem of patients with medicinal marijuana prescriptions to have aces to filling those prescriptions. I'm not going to say the courts are the end all and be all. I think the courts decision to keep insite open is wrong. If people want to keep insite open by a democratic referendum that is one thing. Having the courts over rule a democratically elected government and claim shooting heroine in a safe place is a charter right is absurd. But that's another topic. Right now we have to deal with the catastrophic state of emergency Stephen Harper has now manufactured with his disproportionate crime bill. Cocaine trafficking cases are now getting dropped. That's not even including the investigations like the Western Wind the higher ups have pulled the plug on. Throwing all the pot growers in jail for two years is going to further tax the judicial system and fill the over crowed prisons. Three to a bunk is not acceptable. Privatizing the prisons is not acceptable. Raising taxes to incarcerate nonviolent offenders is not acceptable. The California prison system is not a model we should follow. Instead we should learn from their mistakes.